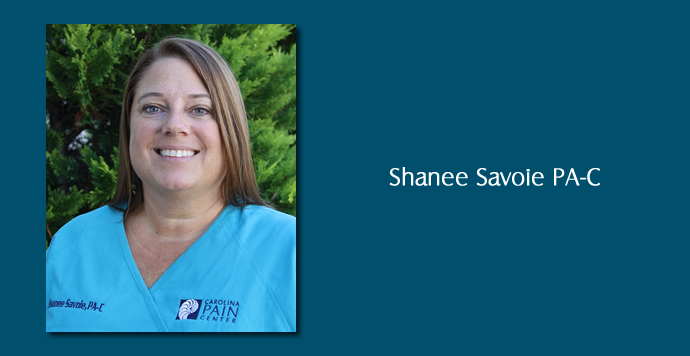 Shanee Savoie PA-C grew up in Alaska before attending her undergraduate program at the College of Idaho. She earned a Bachelor’s degree in biology with minors in chemistry and philosophy. After graduation she lived in the Pacific Northwest for 15 years where she started a family and pursued outdoor interests in skiing, kayaking and mountain biking. She moved to central Pennsylvania and earned a Master of Health Science degree from Lock Haven University of Pennsylvania Physician Assistant program in 2000. She traded the mountains for the coast when she moved to Carteret County. She practiced in family medicine for 3 years then began working in pain management and has been treating pain patients for the past ten years. She is pleased to draw on her experience and collaborate with Dr. Matthew Swiber to implement a multi-modal approach to treat patients with chronic pain. Ms. Savoie can offer non-interventional pain management as well as joint and muscular trigger point injections. In addition, she will develop treatment plans for patients to include ordering imaging, nerve testing and pertinent labs. She will make the appropriate referrals when needed for surgical or other medical specialties, physical therapy and pain psychology. Ms. Savoie, her husband Patrick and their daughter, have been fortunate to claim the Crystal Coast as home for the past 13 years. They have taken full advantage of the activities the area offers and enjoy year-round biking and most watersports.